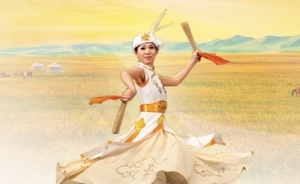 Mongolian ethnic dances can be some of the most dynamic and breathtaking numbers in Shen Yun performances. Often set to a backdrop of a tall blue sky and vast, open grasslands, these dances emphasize big movements of the arms and their coordination with the wrists and shoulders. The Mongolian ethnicity is known for its affinity to horses, and so it is no surprise that the traditional dance of this nomadic group is replete with movements of the horse. Steps resembling a horse’s leisurely gallop, jumps imitating a horse rearing up, horse riding, and cowboy-esque way of life, are all inspiration for impressive movements. The Mongolians also highly revere the eagle, and the large arm movements immediately recall the bird’s awesome wingspan stretching out in a boundless sky. 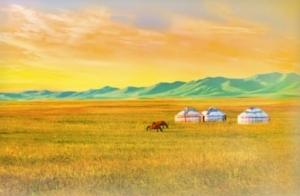 Hospitality is extremely important to the Mongolian people and features prominently in their dances. Mongolian dances often feature bowls, wine cups, and even bundles of chopsticks as dance props. 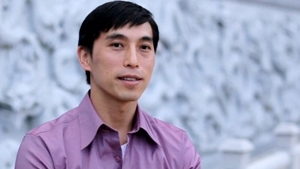 The feel of Mongolian dance is sprightly, bubbling with energy and enthusiasm.